1. Make a homemade meal. Considering that ordering out on New Year's Eve often costs more (since prices are usually increased for the holiday), this is a good excuse to splurge a little and make a family meal at home. 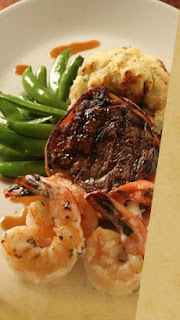 Pick out dinner food that everyone enjoys but you don’t get a chance to have very often, like steak, chili, or lobster. This family meal can turn into a New Year’s Eve tradition. 2. Make fun snacks and desserts. Consider making cookies, toffee, or other desserts that you can make together as a family and eat throughout New Year’s Eve night. You can get even more in the New Year’s spirit by making New Year’s specific desserts. Lots of cultures have New Year’s Eve desserts like Vasilopita, a Greek New Year’s Eve cake baked with a coin hidden in the dough. Whoever gets the piece of cake with the coin will have good luck for the upcoming year. 3. Make some holiday drinks and mocktails. Kids will love having hot cocoa, fruity soda pop, and sparkling grape juice on New Year’s Eve. You can even make other mocktails like strawberry-kiwi spritzers, cranberry sparklers, and peppermint drinks. 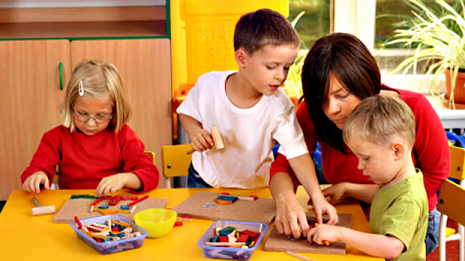 Be sure to use plastic champagne flutes or other plastic “adult” like glasses to make the kids feel really special. Adults can make their own specialty drinks, or stick with classic champagne. 4. Have a family game night. Bring out board games, card games, and electronic games, and even group video games to play as you wait for the clock to strike midnight. You could make up game tournaments, or try to play all the games at least once during the night. 5. Have a movie night. Pop in a movie you already have at home or rent a movie that you all have been wanting to see. Watching a movie can be just one aspect of your New Year’s Eve plans, or you can turn it into a movie marathon. During this time you can eat and drink different snacks that you have prepared for the night. 6. Create a New Year’s Eve photo booth. Arrange an area of your home to be the photo booth stage. Find a wall or background that you can use as a backdrop, and decorate it with some holiday decorations or your written resolutions. You could even print out some masquerade type costume pieces, and have your very own photo props. 7. Play dress up. Bring out everyone’s best clothes and make everyone in the family feel like they are a part of a fancy New Year’s Eve party or ball. You could play music, dance, and everyone’s fancy outfits can make for some great photos. Simply blow up balloons, and create netting around an overhead fan with some tape and wrapping paper or fabric. Place all the balloons inside the netting, and release the balloons whenever you plan to ring in the New Year. Please bring family and friends to Lexington’s annual Christmas Eve Caroling event! 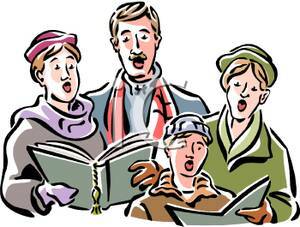 As always, caroling will take place from 4:00 – 4:30 pm on December 24th at the Hastings Park Bandstand in Lexington, which is located at the corner of Massachusetts Avenue and Worthen Road. Join in this town tradition that is enjoyed by several hundred residents and neighbors each year who gather to sing an assortment of traditional and favorite carols. Song sheets, hot chocolate, and cookies will be provided to all! Vocal Revolution, the Northeastern District Barbershop Champions, and winners of WGBH Sing That Thing! season 2 are teaming up with some of this years Sing That Thing winners for a fantastic a cappella extravaganza! Saturday, December 16, at 2:00pm at Cary Hall. On stage will be the Sing That Thing Season 3 collegiate winners Endicott Singers and high school winners Wellesley High Schools Rice Street Singers. Also singing will be VR's own collegiate quartet champions: the 2017 champions Greenlight and the 2016 champions Last Chance! Do you dream of buying a Lexington home in 2018? Are you ready to stop throwing your money away on rent and invest in your future? Home prices and mortgage rates are expected to increase in 2018, so the sooner you buy, the more you might save in the Lexington real estate market! 1. Automate down payment savings. Saving enough money for a down payment is one of the hardest steps for first-time buyers, but the more you put down initially, the lower your monthly payments could be. 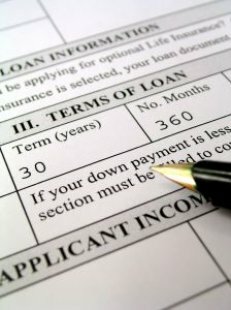 Automate your checking account to save a certain amount of your paycheck each month into a down payment savings account. If you receive any monetary gifts, put them right in the account as well. 2. Build your credit history. Keep your credit history clean by paying off or paying down past debts, paying all of your bills on time, and using no more than 30 percent of the credit available to you. Have bills automatically withdrawn to make paying on time easier. 3. Practice living on a budget. Downsize your spending so you can save more for a down payment and pay off your debts. Don’t by new clothes, cars, vacations, etc. until after you buy your home. Make coffee and your meals at home instead of buying it out. Walk or bike instead of driving when possible. There are all great tips on getting you on your way to saving the money you need for a home in the Lexington real estate market! Enjoy your holidays, and when ready to buy a Lexington home this year or next, contact me, your Lexington real estate agent. I am here for you! Lexington Tea Burning, Demonstrations, Parade, and More! 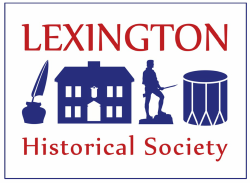 Lexington Historical Society and the Lexington Minute Men invite all to the Lexington Tea Burning. 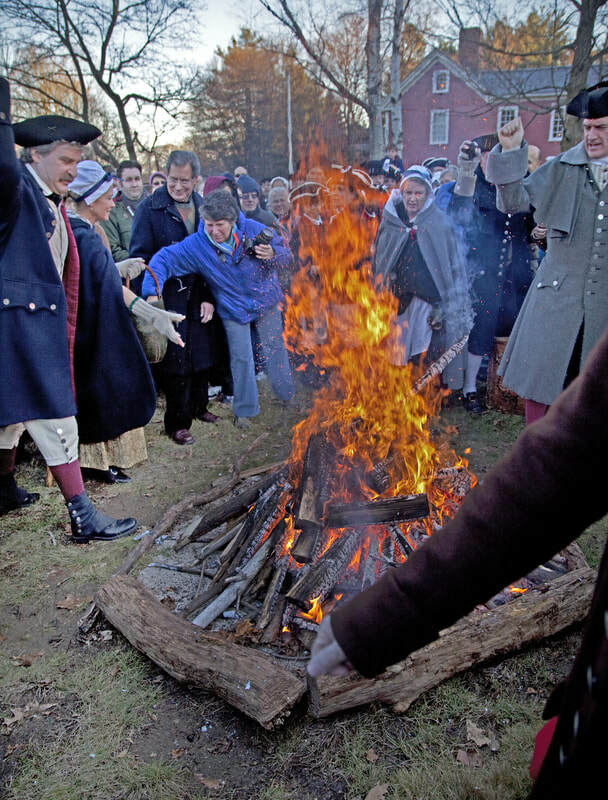 The event will take place on the grounds of another sponsor of the event, the Lexington Visitor’s Center (1875 Massachusetts Avenue) and will begin at 10AM with an 18th century soldier encampment, followed by musket drills, 18th century cooking demonstrations, parades, and music, and culminate with the burning of the tea at 1:30PM. Historic Buckman Tavern will be decorated for the holidays and open for FREE tours.